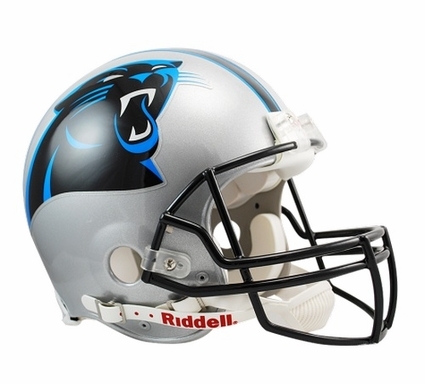 The Carolina Panthers Riddell Full Size Authentic Helmet is an actual competition helmet the team wears during the game. Each Proline helmet measures authentic size and weight with a complete interior pad set. Other features include the Kra-Lite II� Polycarbonate Lexan shell and inflatable liner with 2 inflation points. These NFL VSR4 Pro Line helmets have official game style team decals and colors, along with authentic steel polyvinyl-coated quarterback / running back style faceguards. Authentic Riddell Pro Line helmets are the real deal - perfect for display, gifts, and for autographing. Order your Carolina Panthers Riddell Full Size Authentic Helmet today!